In addition to developing novel features for computerized detection, we have also examined creation of disease atlases as well as methods for assessing disease severity in addition to presence alone. Statistical 3D prostate imaging atlas construction via anatomically constrained registration: In this work we introduce a novelframework for MRI atlas construction that uses an iterative, anatomically constrained registration (AnCoR) scheme to enable the proper alignment of the prostate (Pr) and central gland (CG) boundaries. 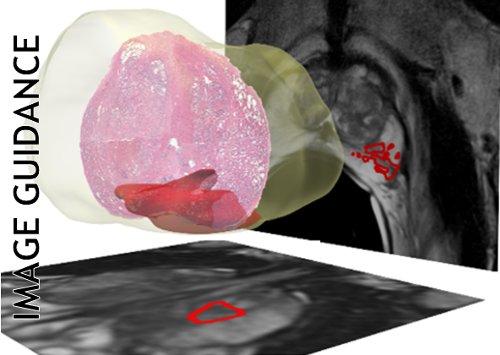 Our current implementation uses endorectal, 1.5T or 3T, T2-weighted MRI from 51 patients with biopsy confirmed cancer; however, the prostate atlas is seamlessly extensible to include additional MRI parameters. 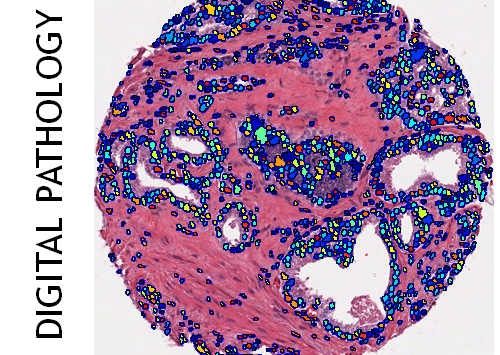 The figure depicts a prostate atlas derived from multi-parametric MRI showing cancer distribution in vivo. Minimal deviation of anatomic landmarks (urethra, veromontanum) was found at 3.64 mm and 4.31 mm respectively. Discriminatively Weighted Multi-Scale Local Binary Patterns for detection of prostate cancer on T2w MRI: We present discriminatively weighted Local Binary Patterns (DWLBP), a new similarity metric to match Multi-scale LBP (MsLBP) in Hamming space. Inspired by supervised learning, our methodology aims to learn the multi-scale, weight vector by minimizing the Hamming scores between positive class samples and jointly maximizing the scores between positive and negative class samples. In this paper we evaluate the efficacy of the DWLBP scheme in detecting prostate cancer from T2w MRI and demonstrate that the approach statistically significantly outperforms MsLBP. 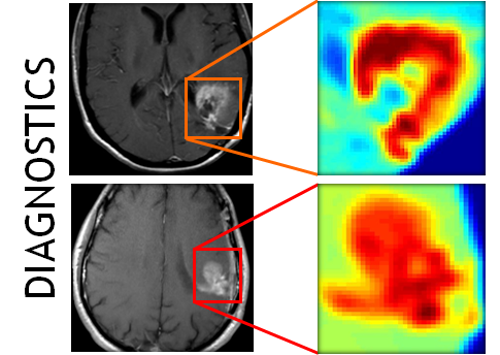 Top row: cancer ground-truth (red) obtained via deformable co-registration of cancer maps from ex vivo histology onto pre-operative MRI for 3 different patient studies. 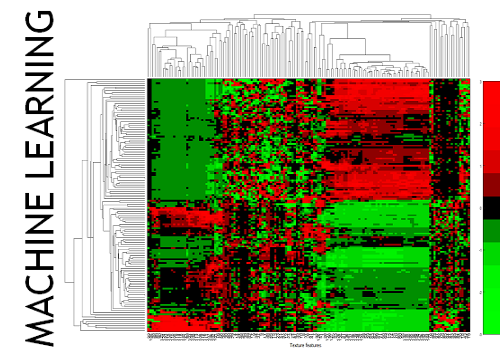 Second rows: heatmaps showing likelihood of cancer occurrence via DWLBP. The color bar shows the suspected probability of being cancer. Multi-Kernel Graph Embedding for Detection, Gleason Grading of Prostate Cancer via MRI/MRS: In this work, we present a novel computerized decision support system (DSS), called Semi Supervised Multi Kernel Graph Embedding (SeSMiK-GE), that quantitatively combines structural, and metabolic imaging data for distinguishing (a) benign versus cancerous, and (b) high- versus low-Gleason grade CaP regions from in-vivo MP-MRI. Our method resulted in an AUC of 0.89 ± 0.09 for distinguishing benign from CaP regions, and 0.84 ± 0.07 for distinguishing high and low grade CaP using a leave one out cross validation strategy, all evaluations being performed on a per voxel basis.